Raawi al Hadith is a narrator of hadith who transmits and narrates the hadith. Every type of literature develops certain features particular to its nature and content and the character of the people who cultivate it, and the distinctive social, political or historical conditions in which it originates and flourishes. Hadeeth literature is no exception to this rule. The isnaad system was used to transmit pre-Islamic poetry. However, it was in the hadeeth literature that it reached its peak at which it was considered an integral part of the religion itself. By the end of the first century the science of isnaad was fully developed. Ibn Seereen (d.110), a Successor (Tabaee), said, “[In the beginning] they would not ask about the isnaad. But when the fitnah (turmoil / civil war) happened, they demanded, ‘Name your men to us.’ The narrations of the Ahlus-Sunnah (Adherents to the Sunnah) would be accepted, while those of Ahlul-Bida’ah (Adherents to Innovations) would be rejected.” That is, prior to the turmoil the isnaad was used only occasionally, but after the turmoil they became cautious. The above promise made by Allah is obviously fulfilled in the undisputed purity of the Qur'anic text throughout the fourteen centuries since its revelation. However, what is often forgotten by many Muslims is that the above divine promise also includes, by necessity, the Sunnah of the Prophet Muhammad ﷺ, for it is the practical example of the implementation of the Qur'anic guidance, the Wisdom taught to the Prophet ﷺalong with the Scripture, and neither the Qur'an nor the Sunnah can be understood correctly without recourse to the other. Allah preserved the Sunnah by enabling the Companions and those after them (may Allah be pleased with them) to memorize, write down and pass on the statements of the Messenger ﷺand the descriptions of his Way, as well as to continue the blessings of practicing the Sunnah. Later, as the purity of the knowledge of the Sunnah became threatened, Allah caused the Muslim nation to produce outstanding individuals of incredible memory-skills and analytical expertise, who journeyed tirelessly to collect hundreds of thousands of narrations and distinguish the true words of precious wisdom of their Messenger ﷺfrom those corrupted by weak memories, from forgeries by unscrupulous liars, and from the statements of the enormous number of 'Ulama', the Companions and those who followed their way, who had taught in various centers of learning and helped to transmit the legacy of Muhammad ﷺ- all of this achieved through precise attention to the words narrated and detailed familiarity with the biographies of the thousands of reporters of Hadith. Action being the best way to preserve teachings, the renewers of Islam also revived the practice of the blessed authentic Sunnah. Unfortunately however, statements will continue to be attributed to the Prophet ﷺalthough the person quoting them may have no idea what the people of knowledge of Hadith have ruled regarding those Ahadith, thus ironically being in danger of contravening the Prophet's widely-narrated stern warnings about attributing incorrect/unsound statements to him. The methodology of the expert scholars of Hadith in assessing narrations and sorting out the genuine from the mistaken/fabricated etc., forms the subject-matter of a wealth of material left to us by the Muhaddithun (scholars of Hadith, "traditionists"). A Hadith (pl. 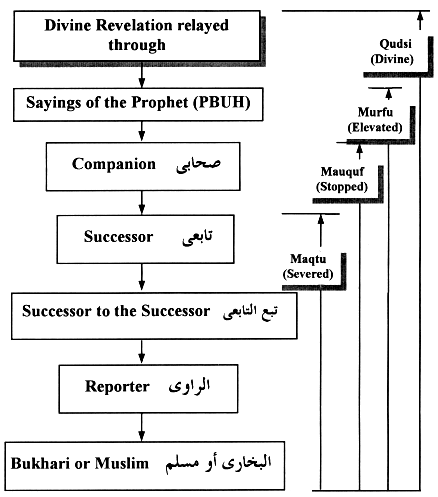 Ahadith) is composed of two parts the Matn (text) and the Isnad (chain of reporters). A text may seem to be logical and reasonable but it needs an authentic Isnad with reliable reporters to be acceptable. Among the sciences of Ahadith is the study of the chain of reporters (the Isnad) and many Muslim scholars have specialized in this field. It includes identifying the name of each and every narrator (reporter), his character (his truthfulness, piety, public behavior), his ability and reputation as a memorizer and the types of narrations he is known to report, whether authentic, weak, fabricated, etc. In addition, each narrator should be identified by a rating given by other narrators who knew him. So all of these and many other details must be considered to know the degree to which a Hadith may be used as a basis for Islamic belief or practice (Sharia), or merely as a point of interest (not to be attributed to the sayings, etc. of the Prophet). Mustalah al-Hadith or Study of Sciences of Hadith is strongly associated with Rijal al-Hadith (the study of the reporters of hadith). Remarks like these are exceptions from the basic Islamic prohibition of backbiting (ghibah) another Muslim, even if the statement is true. Such exceptions are allowed, even obligatory in some cases, where general benefit to the Muslim public is at stake, such as knowing which ahadith are authentic. Reporters who have been unanimously described by statements such as the first two may contribute to a sahih isnad. An isnad containing a reporter who is described by the last two statements is likely to be da'if jiddan (very weak) or maudu' (fabricated). Reporters who are the subjects of statements such as the middle two above will cause the isnad to be da'if (weak), although several of them relating the same hadith independently will often increase the rank of the hadith to the level of hasan (good). If the remarks about a particular reporter conflict, a careful verdict has to be arrived at after in-depth analysis of e.g. the reason given for any disparagement, the weight of each type of criticism, the relative strictness or leniency of each critic, etc. The earliest remarks cited in the books of Rijal go back to a host of Successors, followed by those after them until the period of the six canonical traditionists, a period covering the first three centuries of Islam. A number of traditionists made efforts specifically for the gathering of information about the reporters of the five famous collections of hadith, those of al-Bukhari (d. 256H), Muslim (d. 261H), Abu Da'wud (d. 275H), at-Tirmidhi (d. 279H) and an-Nasa'i (d. 303H), giving authenticating and disparaging remarks in detail. The first major such work to include also the reporters of Ibn Majah (d. 273H) is the ten-volume collection of al-Hafiz 'Abd al-Ghani al-Maqdisi (d. 600H), known as Al-Kamal fi Asma' ar-Rijal. Later, Jamal ad-Din Abu'l-Hajjaj Yusuf ibn 'Abdur-Rahman al-Mizzi (d. 742H) prepared an edited and abridged version of this work, punctuated by places and countries of origin of the reporters; he named it Tahdhib al- Kamal fi Asma' ar-Rijal and produced it in twelve volumes. Further, one of al-Mizzi's gifted pupils, Shams ad-Din Abu 'Abdullah Muhammad ibn Ahmad ibn 'Uthman ibn Qa'imaz adh-Dhahabi (d. 748H), summarised his Shaykh's work and produced two abridgements: a longer one called Tadhhib at-Tahdhib and a shorter one called Al-Kashif fi Asma' Rijal al-Kutub as-Sittah. The work of adh-Dhahabi was not left unedited; al- Khazraji (Safi ad-Din Ahmad ibn 'Abdullah, d. after 923H) summarized it and also made valuable additions, producing his Khulasah. The following is a list of the top 13 narrators of hadeeths among the Prophet’s ﷺcompanions and their students who had their narrations in written form. Abu Hurayrah (5374 hadeeths): Nine of his students were recorded to have written hadeeths from him. Ibn ‘Umar (2630 hadeeths): Eight of his students wrote down hadeeths from him. Anas ibn Maalik (2286 hadeeths): Sixteen of his students had hadeeths in written form from him. ‘Aa’ishah bint Abee Bakr (2210 hadeeths): Three of her students had her hadeeths in written form. Ibn ‘Abbaas (1660 hadeeths): Nine of his students recorded his hadeeths in books. Jabir ibn ‘Abdillaah (1540 hadeeths): Fourteen of his students wrote down his hadeeths. Aboo Sa‘eed al-Khudree (1170 hadeeths): None of his students wrote. Ibn Mas‘ood (748 hadeeths): None of his students wrote. ‘Abdullaah ibn ‘Amr ibn al-‘Aas (700 hadeeths): Seven of his students had his hadeeths in written form. ‘Umar ibn al-Khattaab (537 hadeeths): He recorded many hadeeths in official letters. Alee ibn Abee Taalib (536 hadeeths): Eight of his students recorded his hadeeths in writing. Aboo Moosaa al-Ash‘aree (360 hadeeths): Some of his hadeeths were in the possession of Ibn ‘Abbaas in written from. Defects in the transmitter are a result of 10 factors, five of which are connected to ‘Adaalah (trust worthiness) and five to Dabt or zabt (accuracy).